Hong Kong students on Monday began a week-long boycott of classes, gathering in their thousands for what democracy activists say will be a wider campaign of civil disobedience against China’s refusal to grant the city unfettered democracy. Student activists crowded onto a campus on the northern outskirts of the city, many sheltering from the hot summer sun under umbrellas and waving their faculty flags, as their leaders vowed to ratchet up their campaign if their demands were not met. Democracy campaigners are locked in a showdown with authorities on the mainland after the former British colony’s hopes for full universal suffrage were dashed by Beijing’s plans to vet nominees who want to stand as its next leader. A coalition of pro-democracy groups in the semi-autonomous Chinese city, led by Occupy Central, have labelled the restrictions a “fake democracy”. They have vowed a series of actions including a blockade of the Central financial district. The city’s vocal student community on Monday became the first wing of that coalition to move from protests to direct action — starting a week of class boycotts designed to capture the public’s imagination and bolster the pro-democracy fight. 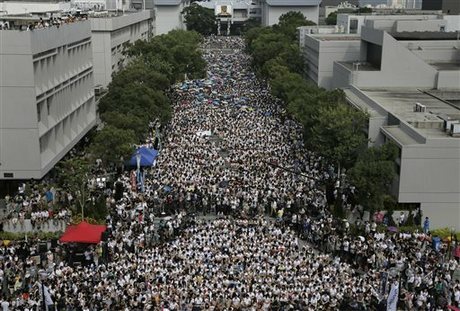 “I don’t think the Chinese government is trying to protect our rights so now we are coming out to fight for our basic needs,” 20-year-old architecture student Wu Tsz-wing told AFP as she gathered with what organisers said were 13,000 others on the leafy campus of the Chinese University of Hong Kong. There was no estimate given by police, who usually quote much lower numbers during similar protests. Alex Chow, chairman of the influential Hong Kong Federation of Students, said student groups would intensify their protests if their call for Hong Kongers to nominate their own candidate to lead the city is ignored. “We demand the government to respond to our call to endorse civil nominations,” he told the crowd. “If we hear nothing from them, the students, the people will definitely upgrade the movement to another level,” Chow shouted. The Chinese University of Hong Kong has become a regular gathering point for students agitating for greater democratic freedoms in the city. The campus boasts a replica of the “Goddess of Democracy” statue which students gathered around during the 1989 Tiananmen protests in Beijing that were brutally crushed by the state. The Hong Kong strike could breathe new life into the democracy campaign, which recently lost some steam after its senior leaders conceded that Beijing is highly unlikely to change its mind whatever they do. Leaders from Occupy on Monday said they were encouraged by the student turnout. “The future belongs to them (the students),” co-founder Benny Tai told AFP. The boycott comes a week after more than 1,500 activists marched through Hong Kong’s streets carrying huge sheets of black cloth and banners demanding genuine universal suffrage. That marked the first sizable protest since China’s National People’s Congress (NPC) ruled in late August that candidates for the 2017 chief executive polls will be vetted by a pro-Beijing committee — and just two or three approved nominees will be allowed to stand. The students can point to their success in 2012, when they were at the forefront of protests against plans by the Hong Kong government to institute a “national education” curriculum seen as pro-China. The government eventually backed down. But in Beijing, the rhetoric in official media has remained unrelenting against any concessions to the Hong Kong democracy movement, which some in the Communist regime see as an insidious threat to their rule of the country as a whole. Tensions in the southern Chinese city, which was handed back to Britain under an agreement that granted greater rights than those seen on the mainland, are at their highest in years over rising inequality and Beijing’s perceived political interference. More than one in five Hong Kongers are considering emigrating because of the political climate, according to a poll by the Chinese University of Hong Kong released Sunday. The poll also revealed widespread pessimism over the city’s political future. On a scale of zero to 10, with zero being “extremely pessimistic”, the average response was 4.22.